Hawaiian pizza is a nice change from the usual pizzas. When you are tired of eating plain pizzas with regular toppings like cheese, pepperoni, sausage or veggies, what you need is to make the hawaiian pizza using this super-easy Hawaiian Pizza recipe. 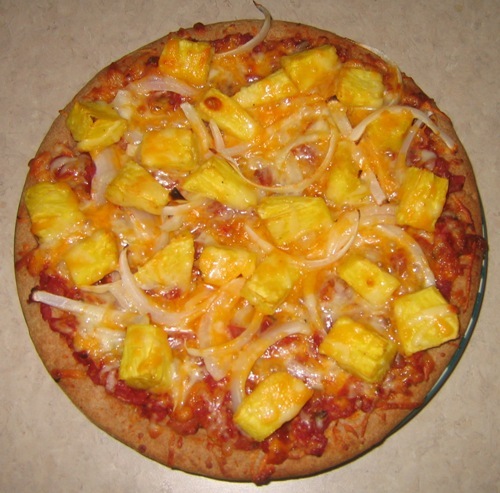 What makes Hawaiian pizza so unique is the use of the chopped pineapple as a pizza topping! Hawaiian pizza gets its name because pineapple is a tropical fruit, and using it on a pizza makes the pizza eating experience feel like you are on vacation in tropical Hawaii 🙂 The pineapple topping on a pizza really makes the Hawaiian pizza stand out from all other pizzas. 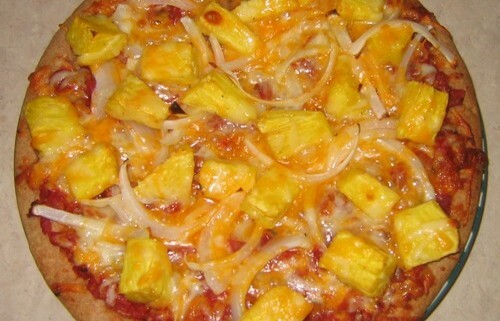 This Hawaiian pizza recipe is a vegetarian version of the Hawaiian pizza – vegetarian Hawaiian pizza recipe uses pineapple and onion slices as toppings. For a non-vegetarian Hawaiian pizza, add cubed ham as a topping – ham and pineapple are a classic Hawaiian pizza toppings combo. 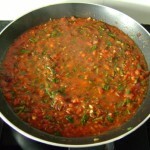 Making pizza at home is very easy and takes less than 30 minutes from start to finish. All you need is a pizza crust, tomato sauce and toppings. Preheat the oven, and while the oven is heating, assemble the Hawaiian pizza – spread the tomato sauce on a pizza crust, sprinkle with cheese and add the Hawaiian toppings – pineapple chunks and onion! Then put the pizza in the oven, and take it out in 20 minutes. It will be piping hot, with melted cheese and roasted pineapple and onion on top – simply mouthwatering! This unique pizza has pineapple and onion slices as a topping, along with melted cheese! Spread the pizza crust with tomato sauce. Put onion slices and pineapple chunks on top. Enjoy this super tasty vegetarian Hawaiian pizza! 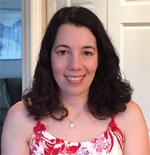 For another vegetarian pizza recipe, see how to make cheese pizza from scratch.